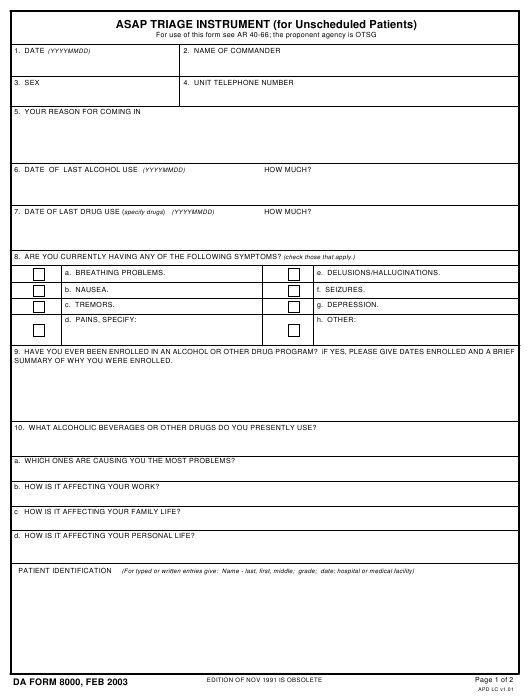 DA Form 8000 - also known as the "Asap Triage Instrument (for Unscheduled Patients)" - is a United States Military form issued by the Department of the Army. The form - often mistakenly referred to as the DD form 8000 - was last revised on February 1, 2003. Download an up-to-date fillable PDF version of the DA 8000 down below or look it up on the Army Publishing Directorate website. 8. ARE YOU CURRENTLY HAVING ANY OF THE FOLLOWING SYMPTOMS? SUMMARY OF WHY YOU WERE ENROLLED. 10. WHAT ALCOHOLIC BEVERAGES OR OTHER DRUGS DO YOU PRESENTLY USE? a. WHICH ONES ARE CAUSING YOU THE MOST PROBLEMS? b. HOW IS IT AFFECTING YOUR WORK? c HOW IS IT AFFECTING YOUR FAMILY LIFE? d. HOW IS IT AFFECTING YOUR PERSONAL LIFE? 12. DO YOU NEED TO DRINK OR TAKE OTHER DRUGS TO HELP YOU COPE? 13. a. ARE YOU CONTEMPLATING SUICIDE? b. HAVE YOU EVER CONTEMPLATED SUICIDE IN THE PAST? 14. ARE THERE ANY OTHER COMMENTS YOU WISH TO MAKE?